Walking into the CenturyLink Center and finding out our seats were much higher and farther to the left of the stage than we had anticipated, had put my friends and me in a meh kind of mood. Not ideal for a concert. 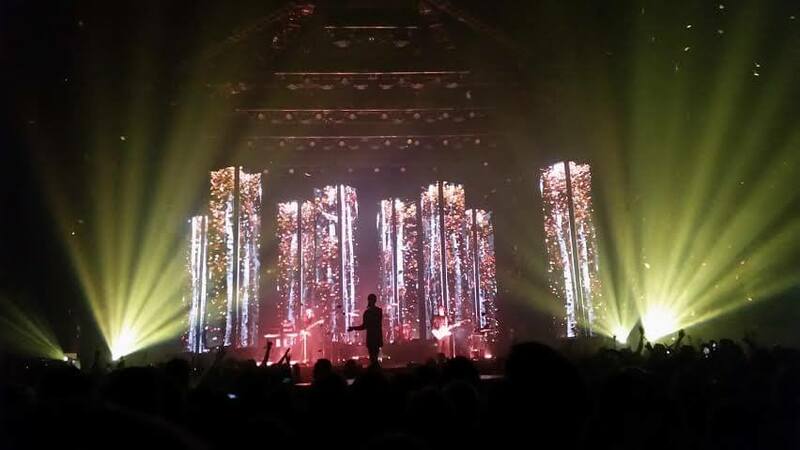 The way the stage was setup, jutting far out into crowd, made our arrangements difficult to truly enjoy the show. It was distracting considering we were mostly looking at the backstage. The arena is very large, but despite the empty and blocked off seats each band put on an amazing show that felt like a special seclusion. We endured the opening band Halsey from our not-so-great seats and I rather enjoyed her spirit. It pained me when my sister searched her name and discovered she is four years younger than I. Such talent on that big stage for a twenty-year-old. Halsey is a wild youth with her blue hair, ripped stockings and I know who I am and love it attitude. Her style of music and voice reminded me of Ellie Goulding or Lorde. She bounced around the stage with such energy and got the crowd pumped for the upcoming bands. Some sections at a higher level than us were being allowed to move down to a lower level. After a little schmoozing and nice smile, my friend got our tickets switched to general admission and yes, the grass was greener on the other side. Or rather the stage was clearer. A whole new experience can be found in the standing area versus sitting in seats. After attending many 12-hour rockfests and standing-only concerts, I can attest sitting in a seat during a concert like this is not an ideal dancing option. Metric played next and although I thought I did not know any of their songs I found myself singing along to quite a few. One song was from a commercial and the others I am still not sure where I encountered them, but I liked what I heard and it clearly stuck with me. 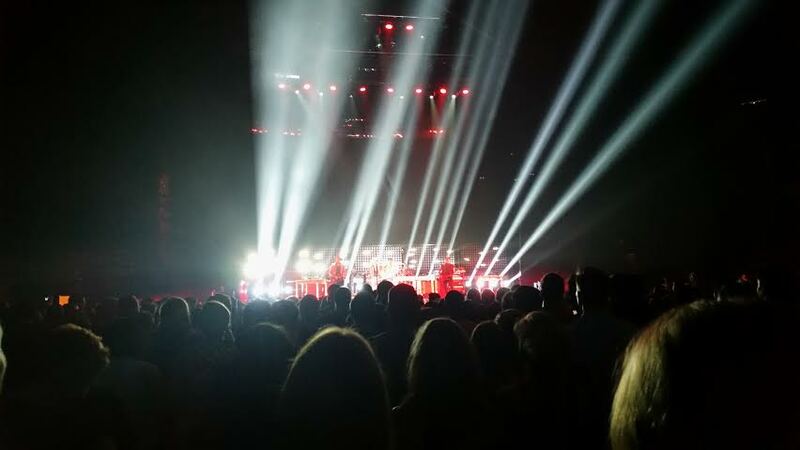 The light show for Metric was fantastic and techno-futuristic. Emily Haines, the lead singer and her bandmates wore multi-colored lighted glasses, rocked out with their instruments and danced in front of a lit-up board that at the end of their set spelled out METRIC. I always wonder why bands have the names they do, the stories behind them. As we were waiting for the headliner, I realized for Imagine Dragons I have never questioned their name. 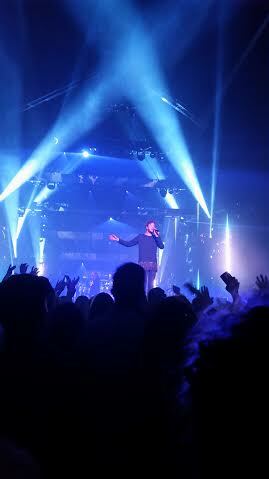 Imagine…Dragons. Okay, sure, I would love to. Like the mythical majestic fiery beast that is full of terrifying wonder, this band played a show that left a burning memory in my mind. The band hit all of the favorites and those that have not been played time and time again on the radio were still great to listen to. I could not wait for them to play my number one, “Radioactive.” It is a frequent on my workout playlist and experiencing it live could not have gotten me more pumped. The crowd was inhaling and exhaling with the lead singer Dan Reynolds in the beginning of the song and jumping with their fists held high, pounding the air in sync with the boom of the drum. “I’m waking up, I feel it in my bones,” boom, boom. “Enough to make my systems blow,” boom, boom. 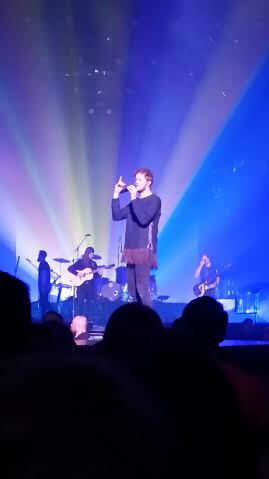 “Welcome to the new age, to the new age.” And welcome Imagine Dragons, please come to Omaha again. And can I mention the light show for just a second, wow. At one point I was blinded by the bright light emanating from the stage. 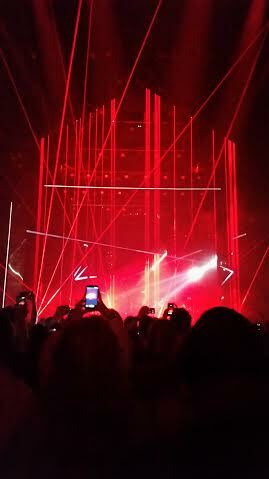 During other songs it was just part of the imagination, red laser beams setup around Reynolds so he and his bandmates were trapped behind them. At the end of the concert the crowd was showered with confetti leaves and Reynolds stood in shadow form on center stage. The smoke and mirrors on the stage were not pushed into our minds, but subtly placed and appeared during certain aspects of the show. By the time the concert was over I felt as though I had heard every song by Imagine Dragons and I wanted to hear them all again. Reynolds was comfortable on stage and it showed, he moved around with ease and interacted with the crowd every chance he got, but not in a forced way, it was as if he was catching up with old friends. 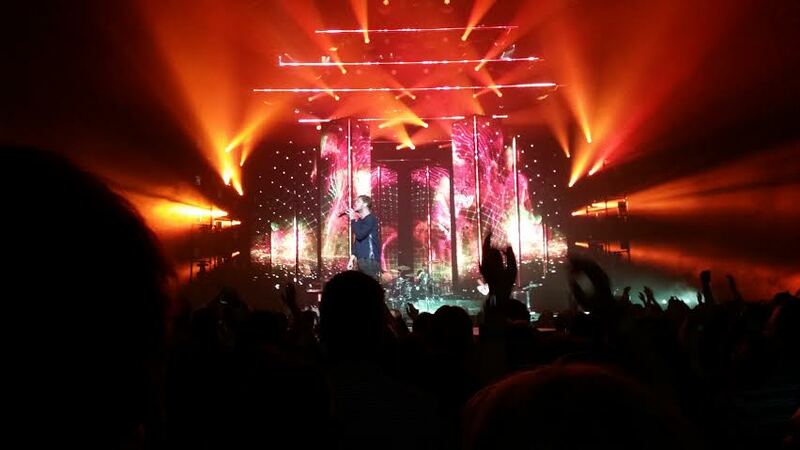 Reynolds stated he has lived in Omaha and Nebraska in the past and that gave the concert an even more intimate feel.